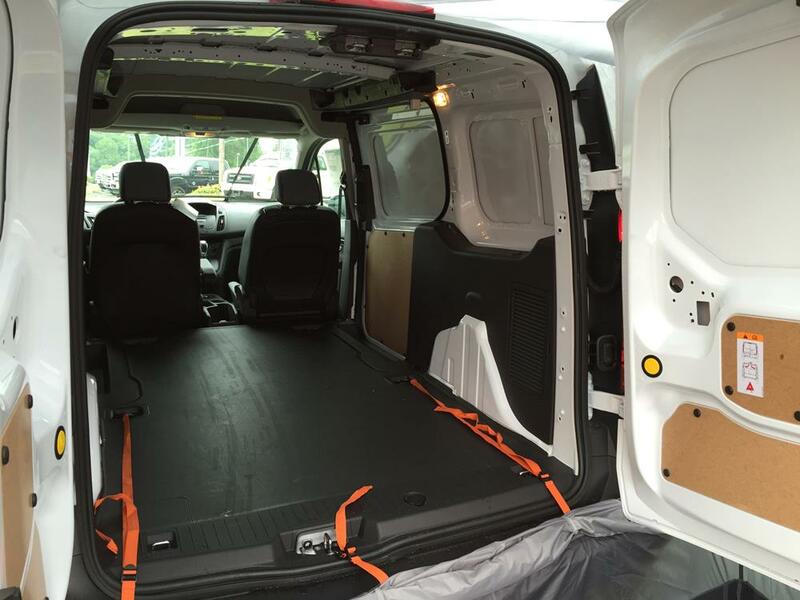 The Ford Transit Connect is an extremely versatile vehicle and Ford’s customers are using the Transit as a mini RV, a family hauler, and a work during the week/play on the weekend vehicle. 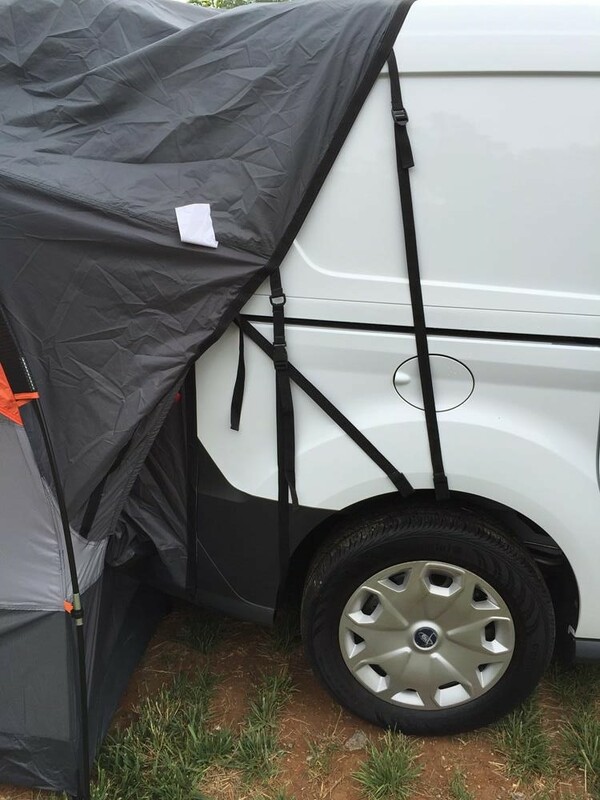 First, we tried the Rightline Gear SUV Tent on the Ford Transit Connect with the rear hatch door. The door is much longer than most SUV doors, but the tent still fit great. You will notice that the rear hatch door will extend into the main room of the tent. You want the end of the door to be even with the seam across the roof of the SUV Tent. The strap that connects to each side of the lower sleeve and goes over the rear hatch door can be used to hold the door a little down from its maximum raised height. You can see this strap through the window of the rear hatch door in the photo below. 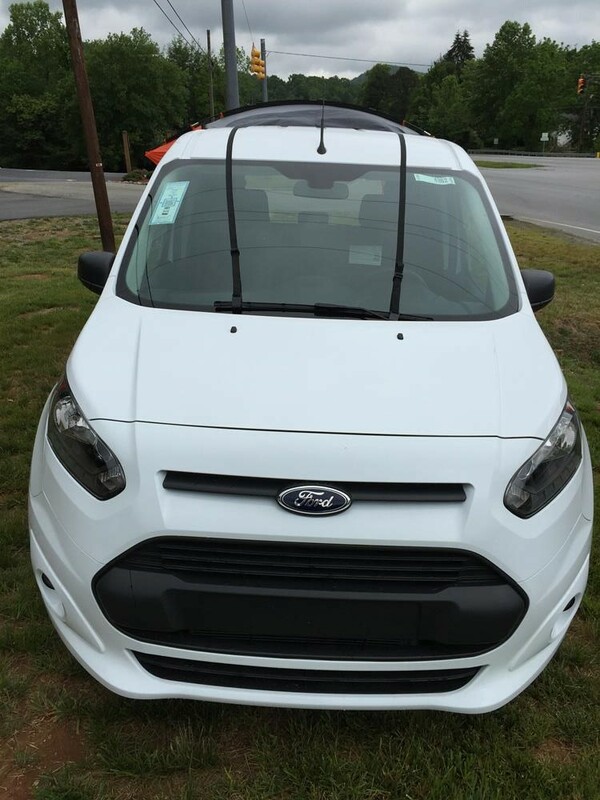 Since the Transit Connect does not come standard with a roof rack, you will need to clip the straps from the front of the upper vehicle sleeve to the windshield wipers. Our set up went great and otherwise, the SUV Tent worked just like it does on any other SUV, minivan, crossover, or wagon. The side straps even attach in the very same way. 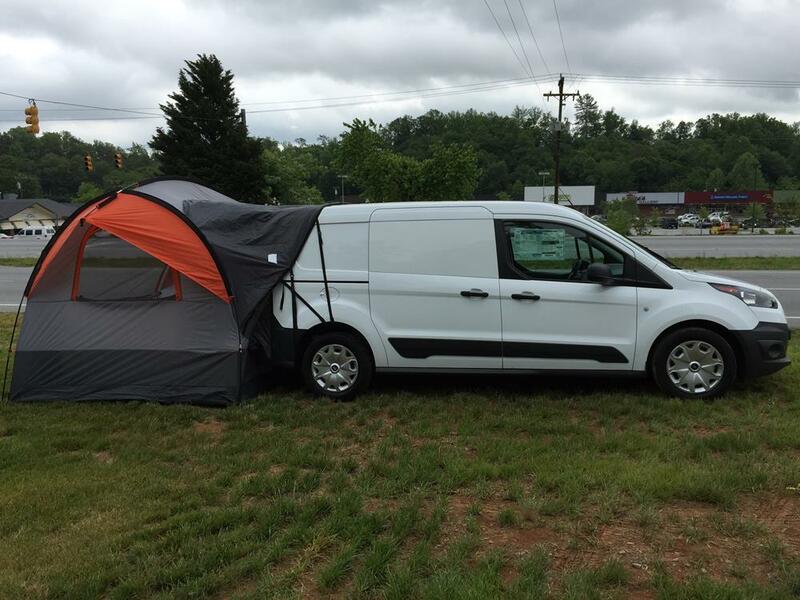 Second, we tried the tent on the Ford Transit Connect with the rear barn doors. The barn doors will stay within the upper vehicle sleeve at their top, but extend into the tent at their bottom. Once again, it is important to tighten the strap that connects to each side of the lower vehicle sleeve (seen in the photo below above the doors). If anyone is sleeping on the floor of the SUV Tent, they will probably want to point their feet towards the vehicle. This positioning will help eliminate a bang on the head from one of the doors in the middle of the night. This Transit Connect has plenty of interior room. 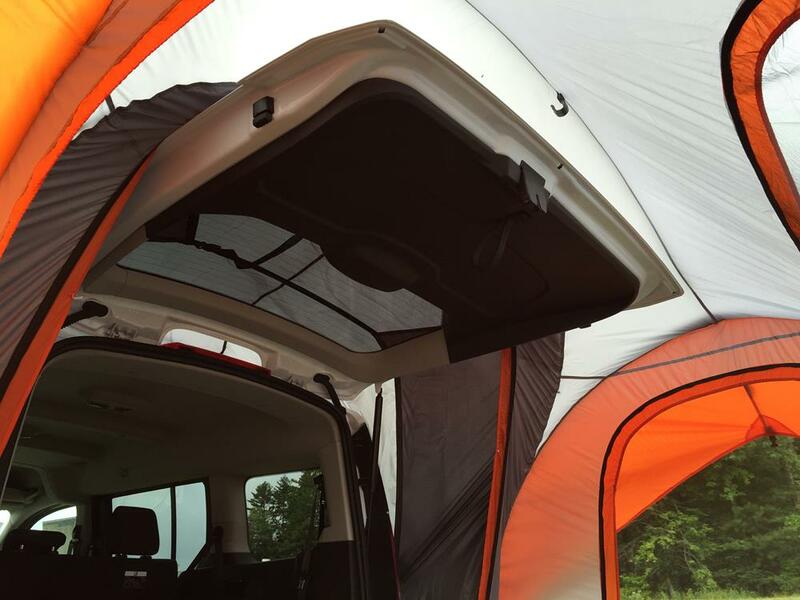 The SUV Tent attaches to the inside of the Transit using the (3) orange straps. The outside looked perfect when finished. We are slightly concerned that in a heavy rain storm, water may pool on the upper vehicle sleeve between the (2) barn doors (depending on how much tension exists on the upper sleeve fabric). As a precaution, we would recommend placing a piece of plywood (or other hard material) over top of the two doors. The wood would keep the water flowing off of the vehicle sleeve under even the heaviest of rains. 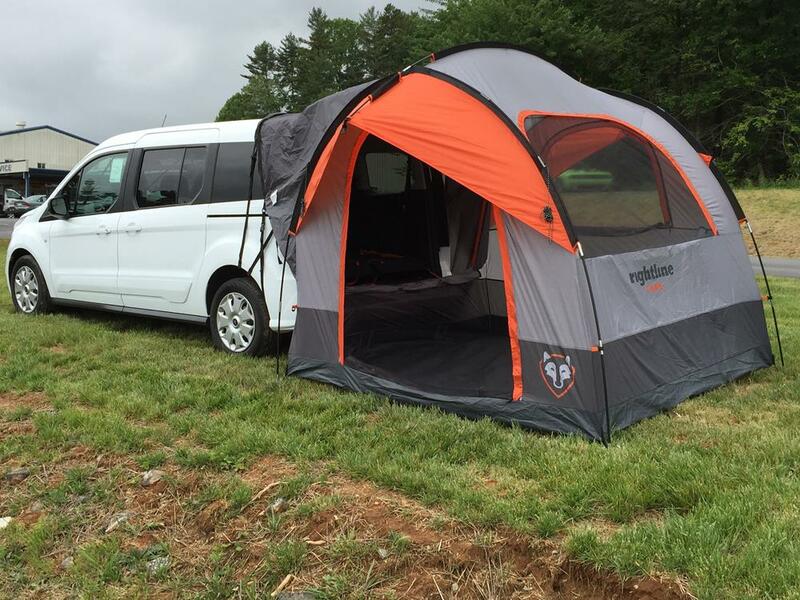 So, after the use of some great vehicles from EGOLF Ford in Brevard, NC, we were able to determine that the Ford Transit Connect works wonderfully with the Rightline Gear SUV Tent!! *We would not recommend the SUV Tent for use with the regular Ford Transit Vans. They are much taller and wider than the Connect at approximately 96″ H x 77″ W.
15 Responses to Will The Rightline Gear SUV Tent Work On A Ford Transit Connect? hi all — i’ve been in contact with some very cooperative people at this company. very responsive! i and my friends have full size conversion vans (dodge tradesman, ford, chevy’s). am close to finishing my latest camper (swb dodge ’99). has anyone used one of these tents on the side or back of a full size ram tradesman (or similar) with barn doors? would love to order two of these when my van is finished but want to be sure the tent will cover the doors when opened and will be large enough to actually cover the opening and the under portion of the van. thanks. Thanks for giving us a call about fitting our SUV Tent to your Sportsmobile. We are looking forward to getting your feedback and seeing how it performs! Please let us know if you have any further questions. Below are a couple of our retailers that ship to Europe. Is the tent set up so that you could easily detach and drive away leaving the tent at your campsite? Looking for info about using Rightline Gear with a Transit Connect . Great article. I have a 2013 Transit Connect with the higher top and Barn doors so about 791/2 inches High versus the aprox 73 inches of newer connect models . What is a max height the Rightline can work with ? Hi Mike. The SUV Tent is designed to be very universal to fit many different types of vehicles. It is difficult for us state a maximum height that the tent will work with as all vehicles are different shapes and sizes. 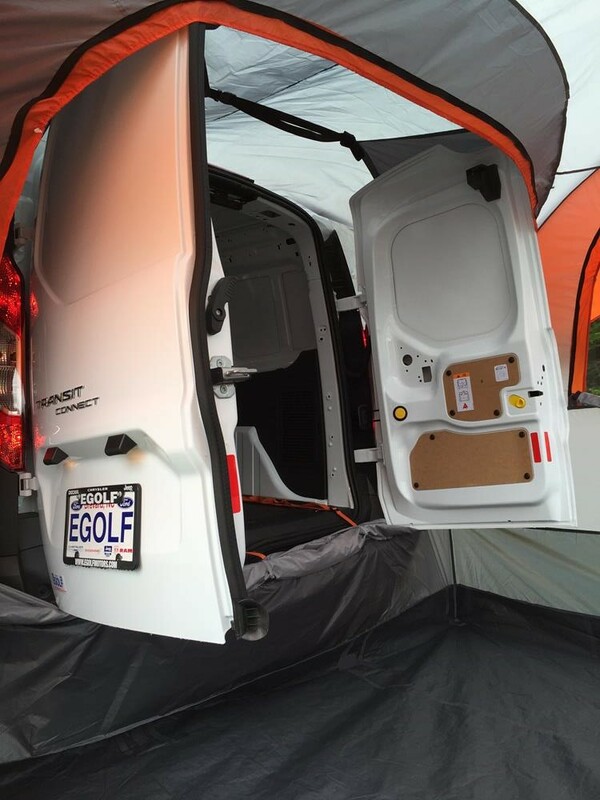 The SUV Tent should fit your 2013 Transit Connect. The slightly taller height shouldn’t be a problem. The photos in the article should give you a good idea as to how the tent will work with your barn doors. The only Ford Transit we can’t recommend the tent for is the Transit Van. This is a much taller vehicle. To give you some additional scale, you can see the SUV Tent setup on a truck with a cap here: http://rightlinegear.com/blog/truck-tent-tips/rightline-gear-suv-tent-on-trucks-with-caps/. We used a Chevy work truck that was quite tall. The tent fit great! Your tent is not double walled is it? How is it going to hold up in Oregon? Or Heavy EU downpours? I like the Connect with this tent. This tent has not listed rain resistance like EU tents guaranteeing rain repellency. If the materials don’t hold water out what sell it? Hello. Our tents feature a 2000mm PU waterproof coating. This will keep the campers dry inside the SUV Tent in any downpour. 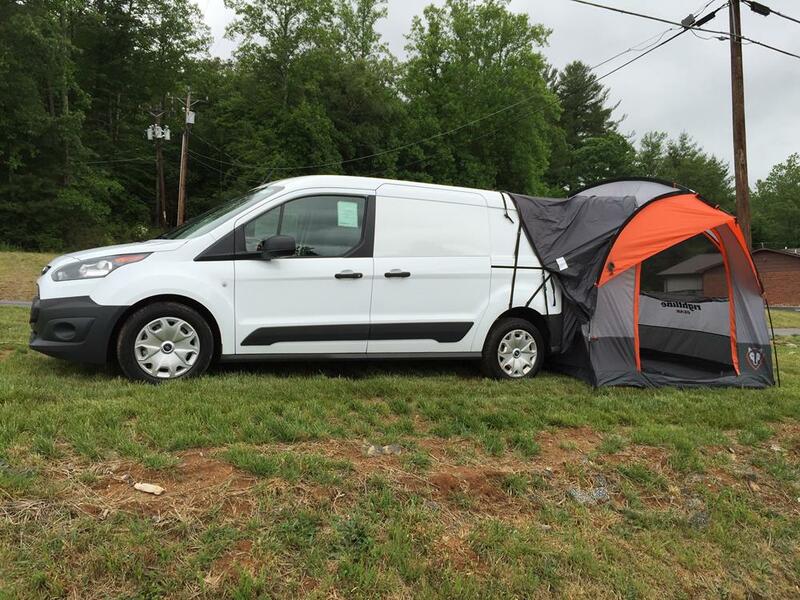 do you have a tent that will fit onto a 12 passenger GMC van with cargo doors? Hello Fred. 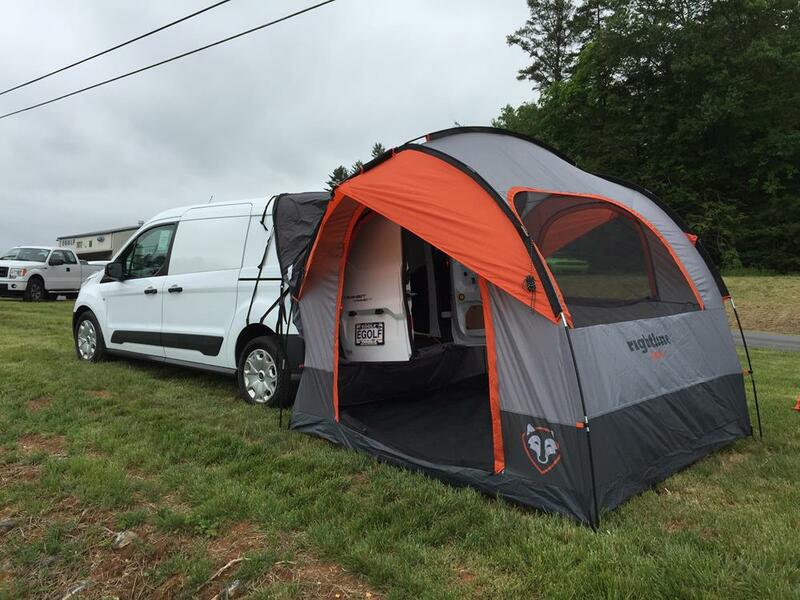 Our SUV Tent should fit your GMC van. You can get some setup tips from our blog article about the SUV Tent fitting a Ford Transit here: http://rightlinegear.com/blog/truck-tent-tips/will-a-rightline-gear-suv-tent-work-on-a-ford-transit-connect/ Your van will have a similar fit to the Transit. For any additional questions please feel free to contact us at 888.685.GEAR. Hello. While we have not tested the SUV Tent fitting to a Fiat 500 L we have designed the tent to be a universal fit. We have customers who fit the SUV Tent to vehicles like the Toyota Prius, and we feel confident that you can get the tent to fit your Fiat. For any additional questions please contact us at 888.685.GEAR.